Silly putty dripping through a hole. Silly putty is an example of a non-newtonian fluid. There are many kinds of non-newtonian fluids, but silly putty, which is a dilatant material, is particularly interesting in the context of facilitation suggestions by participants. In silly putty, the shear viscosity increases with applied shear stress. That is, the harder you hit it, the more viscous it becomes. 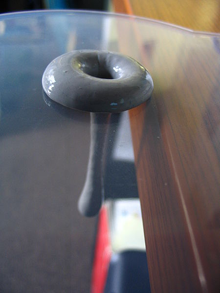 It can drip through a hole, as shown above, but if you hit it with a hammer, it cracks. Here's a link to a video of what happens when you drop a 50-pound ball of silly putty off the third story of a parking garage. It shatters! Making facilitation suggestions to a meeting in which you are yourself a participant can have analogous consequences. The resistance of the group can depend on their perception of your investment in your suggestion. If you seem to be heavily invested, they are more likely to reject your suggestion. Photo by Glitch010101 courtesy Wikipedia (CC BY SA 2.0). Meeting participants who make procedural suggestions to the chair, or facilitator, or to the meeting as a whole, are taking on a portion of the role of facilitator. When these suggestions are welcome, well timed, and infrequent, they can improve the flow of the meeting. And sometimes facilitation suggestions create problems. Offering a process suggestion can be a risky move, even when the group is stuck or in chaos. Here are some tips for improving the chances of making suggestions that actually help. Involvement in the discussion can obscure your view of it. This is why dispassionate facilitation by an uninvolved party is so helpful. Facilitation suggestions from participants can still be helpful, though, if you present them from an honest personal perspective, and if they are received as information about how the discussion looks from your perspective. If someone is acting as the formal facilitator, he or she might already have thought of any process suggestion you might offer. And there might be good reasons for not adopting it, or not adopting it yet. A suggestion might nevertheless be welcome, if you offer it in a way that acknowledges the facilitator's skill and perspective. If you've already taken a position on the matter in question, or if people believe they know what your position is, some who hold other views might interpret your facilitation suggestion as a ploy to advance your own position on the matter, even if that isn't your intention. This is especially likely if the discussion is polarized. And it doesn't matter to others whether they can divine how your suggestion advances your position — they can doubt anyway. on the matter in questionfacilitation suggestions are more likely to be accepted if you've been neutral on the matter in question, not only in the current discussion, but in all previous related discussions. Even if you've taken no position on the matter in question, facilitation suggestions can be seen as attempts to seize or consolidate power within the group. For instance, if someone who's seen as an ally of yours would benefit from the suggestion, doubters might assume that the two of you have a deal going. Restrict your facilitation suggestions to matters that don't advance your own position or the positions of anyone regarded as allies of yours. Would you like to see your comments posted here? rbrenDZIfxfvKBPYebYvjner@ChacbLtlJXPcaqKpZWwEoCanyon.comSend me your comments by email, or by Web form. I offer email and telephone coaching at both corporate and individual rates. Contact Rick for details at rbrenMBpxdNaSmNEPcHyRner@ChacKgmULdQPjPbkOhPqoCanyon.com or (650) 787-6475, or toll-free in the continental US at (866) 378-5470.